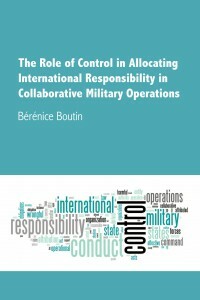 On Thursday 22 October 2015 at 12:00, Bérénice Boutin will publicly defend her doctoral thesis entitled “The Role of Control in Allocating International Responsibility in Collaborative Military Operations”. The thesis addresses the responsibility of States and international organizations for violations of international law committed during collaborative military operations. More specifically, it enquires into the role of control for allocating responsibility between States and international organizations in the context of military operations. From sexual abuses by peacekeepers, to air strikes causing disproportionate casualties, violations of international law have recurrently been occurring in the course of collaborative military operations. Yet, it often remains unclear which participant(s) can be held responsible for which wrongful conduct. This is notably because, during collaborative military operations, different elements of military control are distributed between several States and international organizations. In turn, the notion of control is often used as a legal criterion to determine responsibility. Against this background, the thesis analyses how forms and degrees of military control can translate into forms and degrees of responsibility. In order to provide answers to the question of allocation, the study engages in a reinterpretation of existing rules through the lens of the concept of causal control. In essence, the thesis argues that a State or international organization can be held responsible when its direct or indirect exercise of, or failure to exercise, a form of control qualifies as a cause of a given wrongful conduct. In this argument, different forms and degrees of control can be causally linked to the occurrence of different types of harmful acts, and responsibility can be allocated on that basis.